Name: Phone: Email: What are you looking for? To participate in this auction, please log in using your e-mail address. You will know you are logged in if you see your e-mail address in the top right hand corner of this page. To see additional views and information about each item, please click on the picture. 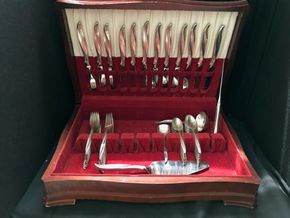 This auction is available for pre bidding NOW. Once the Live Auction starts at 8:30pm beginning with Lot 1, each subsequent lot closes thereafter individually. If you leave a left bid prior to the Live Auction opening at 8:30, the computer will continue to use your bid amount automatically until your bid is outbid. The current bid price will change once the auction has started to show the highest bid on each item. If you have placed a higher bid than the current price, your bid will be $5 higher than the current bid. Once the auction has ended, you will be notified by e-mail if you have won that item. You may pay for your items at pick up via cash or credit card or Paypal. Please bring a copy of your winning email to the pick up. Exact dates will be provided in the e-mail sent to you upon winning your item(s). Applicable sales tax and a 20% buyers premium will be automatically added to your winning bid. Invited Sales reserves the right to decide on all winning bids. You can always check if you are the highest bidder or what you have either won or have been outbid on, by clicking on your e-mail account in the top right hand corner of the page. If you are a tax-exempt customer, please verify that we have your tax-exempt certificate on file BEFORE the auction start time and enter your tax exempt number when paying. All items are sold AS IS - WHERE IS. Your final bid is binding. If you have any questions or concerns regarding this auction, please e-mail billing@invitedsales.com. You can also contact us at 516-279-6378 or e-mail live@invitedsales.com. Thanks for bidding and have fun! Please note that there will be a 20% buyers premium added to all winning bid amounts. 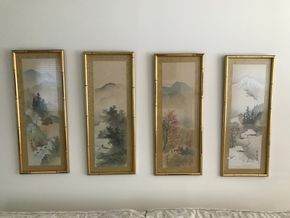 Lot 001 Lot Of Four Japanese Prints. PICK UP IN STONY BROOK. 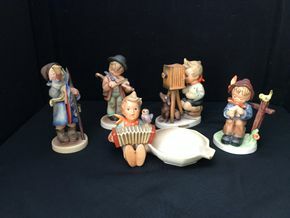 Lot 003 Lot Of Five Hummels. 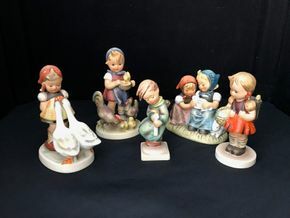 Hummel Girl With Geese 4H Hummel Girl With Chickens 4.5H, Hummel Girls Easter Time Girls With Rabbits 4H, Hummel School Girl With BackpackAnd Basket 5H And Hummel Boy Heavenly Angel Bee Boy With Candle 6H. PICK UP IN STONY BROOK. 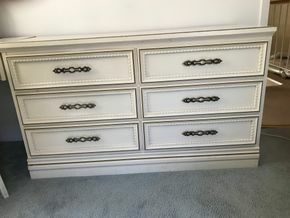 Lot 004 Johnson Carper Faux Bamboo Dresser With Six Drawers. 30H X 18W X 51L. PICKUP IN STONY BROOK. 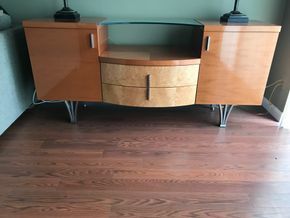 Lot 005 Johnson Carper Desk Approx 30H X 32W X 42L. PICK UP IN STONY BROOK. 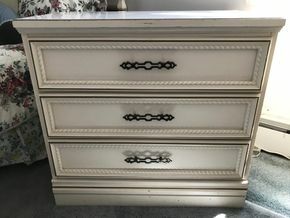 Lot 006 Johnson Carper Faux Bamboo Three Drawer cabinet. 30H X 18W X 32L. PICK UP IN STONY BROOK. 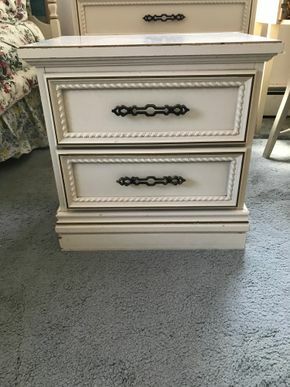 Lot 007 Johnson Carper Faux Bamboo End Table. Approx 22.75H X 16W X 23L. PICK UP IN STONY BROOK. 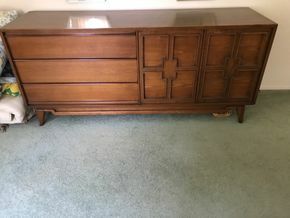 Lot 008 John Cameron Mid Century Dresser With Eight Drawers. 48.5H X 20W X 58.75L. PICK UP IN STONY BROOK. 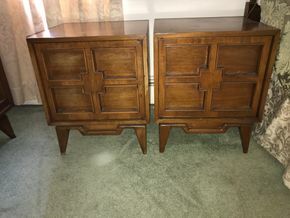 Lot 009 Lot Of Two John Cameron Mid Century End Tables. AS IS Scratches. 24H X 18W X 19.5L. PICK UP IN STONY BROOK. 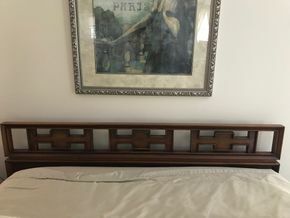 Lot 010 John Cameron Mid Century Head Board. 35.25H X 2W X 62.75L. PICKUP IN STONY BROOK. 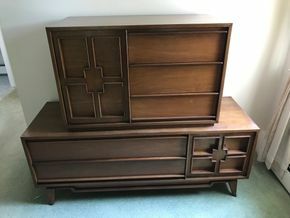 Lot 011 John Cameron Mid Century Dresser With Six Drawers. 31H X 20W X 70L. PICK UP IN STONY BROOK. 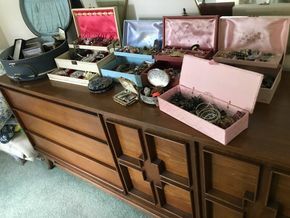 Lot 012 Lot Of Assorted Costume Jewelry. PICK UP IN STONY BROOK. 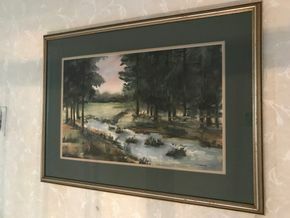 Lot 013 Water Color Signed By ZWANGER. Approx 22L X 14W. PICKUP IN STONY BROOK. 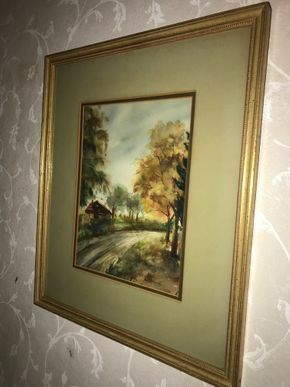 Lot 014 Framed Water Color Landscape. 12.5L X 9.5W. PICK UP IN STONY BROOK. 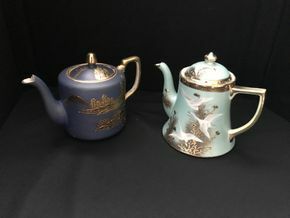 Lot 015 Lot Of Two Decorative Japanese Porcelain Teapots. Approx Dark Blue 5.75H. PICK UP IN STONY BROOK. 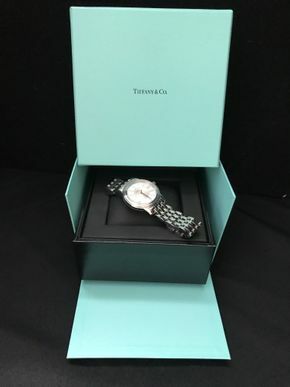 Lot 016 Tiffany Mens Stainless Steel Quartz Watch. 6.75 Overall Wrist Size. PICK UP IN STONY BROOK. 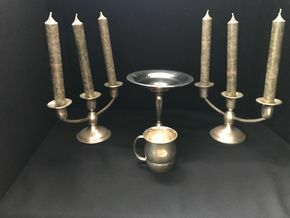 Lot 017 Lot Of Assorted Sterling Silver Candle Stick Holders Approx 4.75H X 8.5W, Candy Dish Approx 6H And Creamer 2.75H. PICK UP IN STONY BROOK. 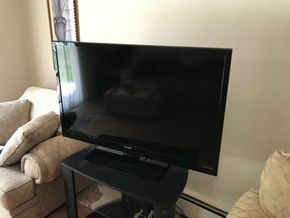 Lot 018 Sharp 47 Inch TV. PICK UP IN STONY BROOK. 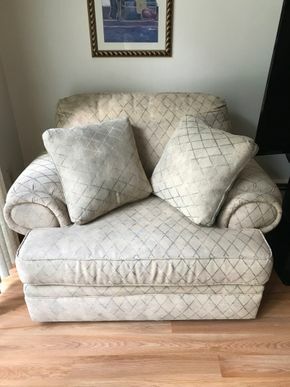 Lot 019 Broyhill Club Chair. Approx 33.5H X 42W X 49L. PICK UP IN STONY BROOK. 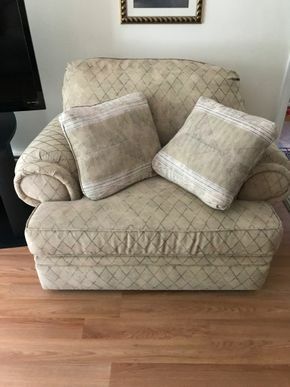 Lot 020 Broyhill Club Chair. Approx 33.5H X 42 W X 49L. PICK UP IN STONY BROOK. 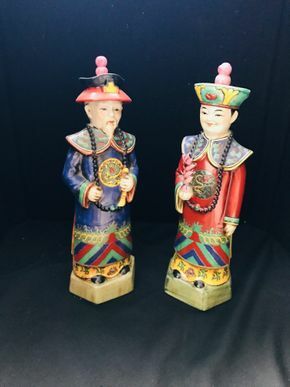 Lot 022 Lot Of Two Japanese Porcelain Figurines. 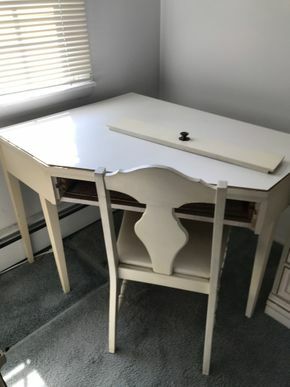 Approx 13.75 H. PICK UP IN STONY BROOK. 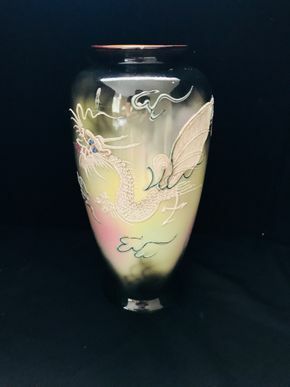 Lot 023 Japanese Dragonware Vase. Approx 12.25H. PICK UP IN STONY BROOK. 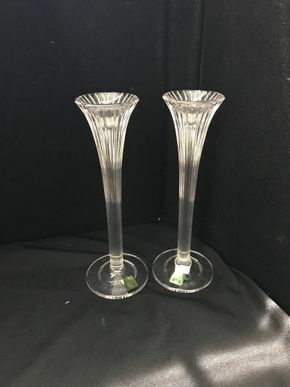 Lot 024 Lot Of Two Marquis Waterford Crystal Candlestick Holders. 10 Inches H. PICK UP IN STONY BROOK. 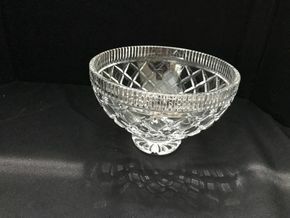 Lot 025 Waterford Crystal Bowl. 5 Inches H X 7.75W. PICK UP IN STONY BROOK. 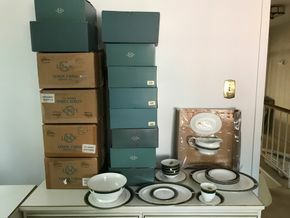 Lot 026 Lot Of Lenox China Classic Edition. Fifteen sets of Five Piece Sets, Four Fruit Bowls, Four Soup Bowls, One Round Platter, Two Oval Platters,One Gravy Boat With Platter. PICK UP IN STONY BROOK. 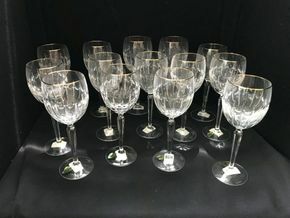 Lot 027 Lot Of Fourteen Waterford Crystal Grenville Wine Glasses. 8 Inches H. PICK UP IN STONY BROOK. Lot 028 Italian Olive Burl Dining Room Table 31H X 54.5W X 74L. PICK UP IN ROCKVILLE CENTRE. 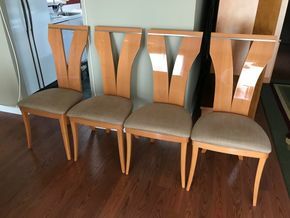 Lot 029 Lot Of Four Italian Wood Dining Room Chairs. 42H X 17.5W X 19.75L. PICK UP IN ROCKVILLE CENTRE. 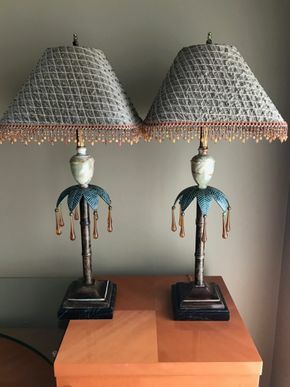 Lot 030 Lot Of Two Contemporary Lamps With Beaded Shades. 33H. PICK UP IN ROCKVILLE CENTRE. Lot 031 Italian Olive Burl Side Cabinet With Two Drawers. 34H X 21.5W X 73L. PICK UP IN ROCKVILLE CENTRE. 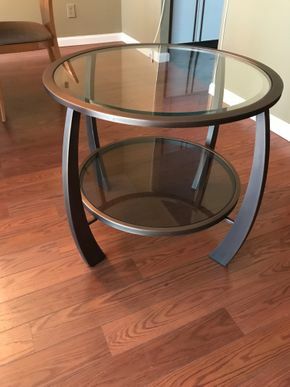 Lot 032 Glass Wood/Metal End Table. 25.5H X 28. PICK UP IN ROCKVILLE CENTRE. 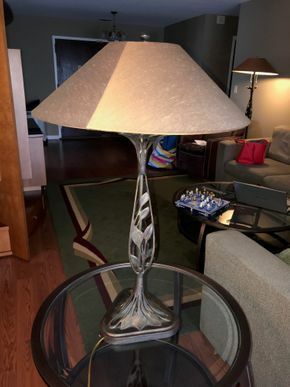 Lot 033 Contemporary Lamp With Leaf. 34.5H. PICK UP IN ROCKVILLE CENTRE. 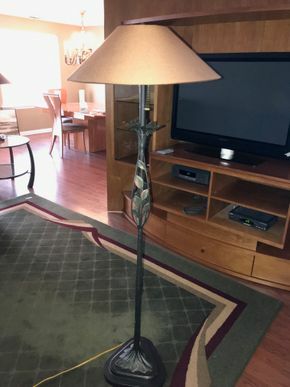 Lot 034 Contemporary Iron Floor Lamp with Leaf. 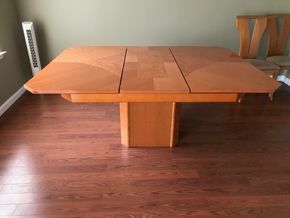 64.5H PICK UP IN ROCKVILLE CENTRE. 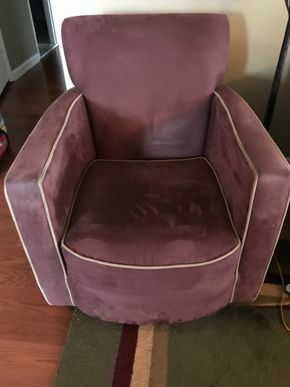 Lot 035 Ultra suede Carter Swivel Chair. 32H X 36.5 X 28.5L. PICK UP IN ROCKVILLE CENTRE. 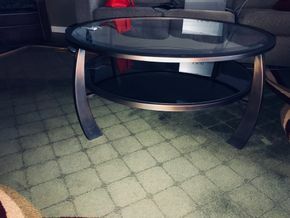 Lot 036 Wood/Metal Glass Round Coffee Table. 18H X 40. PICK UP IN ROCKVILLE CENTRE.